National Police Week, May 13 – 19, 2018 - 129 fallen officers in 2017 were honored at the NLEOMF Annual Candlelight Vigil. National Police Week is a collaborative effort of many organizations dedicated to honoring America’s law enforcement community. In 1962, President John F. Kennedy proclaimed May 15th as National Peace Officers Memorial Day. Each year, the week in which May 15th falls, is declared National Police Week. In conjunction with National Police Week, the Annual Candlelight Vigil at the National Law Enforcement Officers Memorial took place on Sunday, May 13, 2018. This year’s ceremony honored 129 federal, state and local law enforcement officers who were killed in the line of duty in 2017 and a total of 360 American law enforcement heroes. The newly engraved names of officers were read aloud and formally dedicated during the candlelight vigil. National Police Week pays special recognition to those law enforcement officers who have lost their lives in the line of duty for the safety and protection of others. Tens of thousands of law enforcement officers from around the world converge on Washington, DC during National Police Week to participate in a number of planned events which honor those that have paid the ultimate price. The memorial, located at Judiciary Square, honors law enforcement officers from all 50 states, the District of Columbia, U.S. territories and federal law enforcement and military police agencies who have died in the line of duty throughout history. Since the first recorded police death in 1791, there have been over 21,000 law enforcement officers killed in the line of duty. Sadly law enforcement fatalities are up 4% from this same time last year. Of the 53 fatalities reported through May 14, 2018, 28 have been firearms-related. In 2017, a total of 44 officers were shot and killed, with the highest percentage involving officers responding to a domestic disturbance or domestic-related incident. In 1984 the National Law Enforcement Officers Memorial Fund (NLEOMF) was established to tell the stories of American law enforcement officers and honor the fallen. 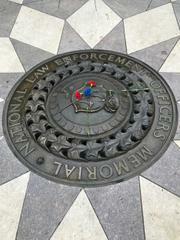 If you would like more information about the National Law Enforcement Officers Memorial, visit http://www.nleomf.org. A short video of our participation in this year's Unity Tour and Candlelight Vigil https://youtu.be/4Lx-7kMZPU4.